Do employees get paid for bad weather shutdowns? Are businesses required to pay employees during bad weather shutdowns? Many companies have faced an emergency shutdown due to severe weather, so it is important to know whether you need to pay employees during those shutdowns. Pay requirements differ by employee classification and by state law. Bad Weather Pay Procedures: Do you pay employees during an emergency closure? Are you required to pay your employees during that time? The answer is “yes”, ”no”, and “sometimes”. NO– You usually do not have to pay hourly employees when the business is closed down due to an extended emergency, especially if you have a written policy stating that you do NOT pay during closures due to inclement weather or natural disaster. Get your policies in writing: It is important to put your policies in writing and communicate it to all employees. Consider purchasing a professionally done Employee Handbook, which will cover this policy along with many others. SOMETIMES– Some states do insist on Reporting-to-Duty pay that says you must pay any employee who shows up to work as scheduled even if there is no work available. Among those states are CA, CT, DC, MA, NH, NJ, NY, OR and RI, though some limit it to certain industries while others only to minors (OR). So even if the business is closed, if the employee makes it to the worksite you have to pay. The rules differ by state on Reporting-to-Duty Pay, but they usually require a half-day’s pay: 2 hrs minimum, 4 hrs maximum. Some states also limit Reporting Time Pay to just those who are scheduled to work 4 or more hours. See your particular state’s website for details on applicable labor law. Plan ahead: Be prepared in case of an emergency shutdown by having an up-to-date contact list for your employees. If your business must close, especially for more than a day, then call all employees and revise their schedules as needed. Have the correct policies in place: Once again, this is an area where a good Employee Handbook can help. Set up your employee policies for OT, Exempt Employee Deductions, Inclement Weather, Natural Disaster, and Report to Duty Pay. Consider a professionally designed Employee Handbook, customized to your business. Typical call-in procedures: Your written bad weather policy should tell your employees what is expected of them. Usually, it will state that they are to call-in (if phone system is operating). The call-in is considered an excused absence. If you pay for bad weather days, you should state the amount of hours and who is eligible (full-time? part-time? temp employees?). Have your policy in writing. It is important that you let your employees know what your policy is whenever a shutdown should occur. The best way is to get your Bad Weather Policy in writing before the event happens. As part of your Employee Handbook, you should have a policy for inclement weather, stating your pay policy (usually it is “day off without pay”), call-in procedures, and examples of what is considered “bad weather”. Thanks for visting Genuine HR. We hope you have found our site informative. GenuineHR.com is a service of New Wind Business Solutions, providing Human Resources information, services and products. Genuine HR (including its parent company New Wind Business Solutions) provides no legal advice or financial advice. Information in our products, services, downloads, and websites is intended for general business information and training purposes only. For specific understanding of how the law applies to you or your organization, please seek legal or tax counsel. Genuine HR has not made and cannot make any such advice. It is not the responsibility or duty of Genuine HR to assess a site-user’s or client’s need for any such legal or financial services at any time. The advice and strategies contained in our articles, products, and services may not be suitable for every situation. If legal, financial or other expert assistance is required, the services of competent professionals should be sought. Are Employee Rest Breaks Mandatory? Must an Employer give all employees a break? Do you have to give your employees a rest break every 4 hours? How long does the break have to be? Are breaks paid time or unpaid? The answer depends on your state. Some states do require breaks for non-exempt employees, though most do NOT have any such requirements for adults. There are often more regulations concerning the work hours for minors, including type of work done, length of workshift, or even work days. Federal law: The federal law does NOT require any breaks from private employers. What it does require is that any work breaks that are 2o minutes or less must be paid. That is it. If your state does not have its own break laws, then you go by the federal standards. State Laws differ. Currently, the DOL only lists 9 states that have mandatory break laws for adults: CA, CO, IL, KY, MN, NV, OR, VT, WA. Most of these impose the following: 10 minutes per every 4 hours of work. There may be additional regulations for minors or specific industries. New York, especially, is known for arcane work laws for particular industries (some of which no longer exist). What if my state does not require a break? Even though many states do NOT require breaks, most employers still offer breaks to their employees, giving them the chance to stretch, use the restroom, smoke, snack, or get some fresh air. You as an employer need to decide if it makes good business sense to provide those breaks. What about exempt employees? Employees who are exempt from overtime, are usually also exempt from break and lunch rules. Most employers will offer exempt employees the same number of breaks that are given to hourly employees, but that decision is yours to make. Establish your break rules in writing. Make sure there is a section in your company employee handbook covering this topic. Setting your rules in writing helps to prevent any confusion and also makes it easier to enforce your standards. Consult a labor law attorney for help in designing an Employee Handbook that will meet the legal requirements for your state, local, industry, and size. Whether employee breaks are required or not, most employers find that breaks help with productivity. Encourage employees to use their break times for their personal needs, like phone calls, smoking, snacking, and chatting with one another. Planning on Hiring Employees soon? Consider some of our guidebooks. You will find them practical and helpful. Click on the book cover that interests you to learn more. Are Employee Lunch Breaks Mandatory? Employers have many questions concerning meal breaks: Are you required to give an employee a lunch break? Is it only for those who work 8 hours? How long should an employee lunch be? 30 minutes? 1 hour? Should it be paid or not paid? Did you know that only 20 states require private employers to give adult employees a meal period? The majority of states have NO lunch break requirement for adults in the private sector (though 34 states have laws about meal periods for minors). Federal law: The federal government does not require private companies to offer lunch breaks. However, if a break is 20 minutes or less, it must be paid. To avoid violating this law, most employers set unpaid lunches at 30 minutes or longer. If someone clocks back in a little early you will not be in violation of the federal law. Exempt Employees: Often rest break and meal period rules do not apply to salaried- exempt employees. See the DOL link above for details. Get your policies in writing: We recommend that an employer gets their lunch breaks and rest breaks set up as formal policies and put them in writing in an Employee Handbook. Creating a handbook takes time and requires hiring an attorney to either create it or to at least review it, to make sure everything is legal. 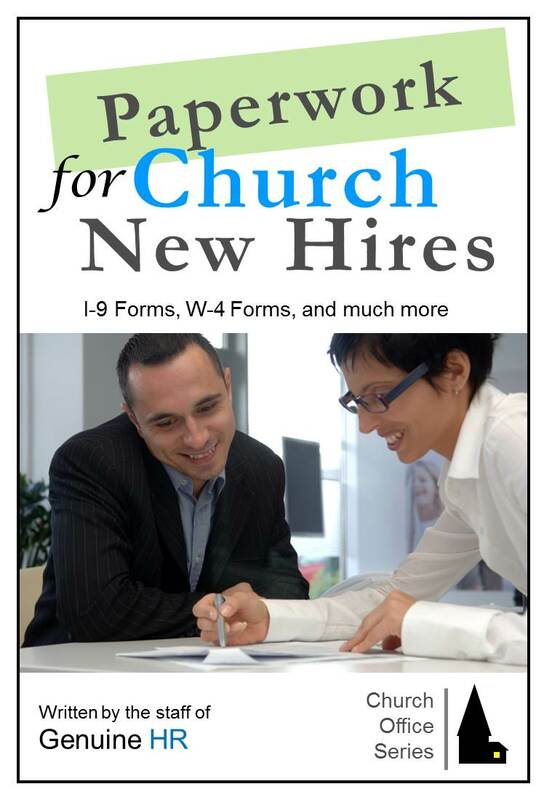 Our latest business book, HIRING PAPERWORK, will be free for two days on Amazon (March 28-29, 2014). This is an excellent resource to help with the following: Form I-9, W-4 Form, New Hire Registry, E-Verify program, and other new hire paperwork. Download a copy to your e-reader, smart phone, or computer to have it on hand when you process your next new employee. Want to read more about HIRING PAPERWORK? See our previous post. Are employee lunch breaks required? Get your policies in writing: It is essential for businesses to get your policies like breaks and lunches in writing, such as an employee handbook. Make sure all managers and supervisors understand the law so that no one inadvertently breaks the law, because it could cause your company to face some expensive fines.